Dimentional flashbang: This works well with incisor beam and commando prestige class actually VERY well so keep that in mind. Fire at will! : has the capacity to be quite useful with the doom canon but, in normal combat expect slight damage and nothing much else. Bridge Shot: i found this ability to do less damage than it says on the tin why? i don't know. Possibly the tendency for the enemy to resist Weapons Disruption. In my personal opinion a good pick for high difficulties. Epic: Matter restoration: Massive healing for everyone super useful overall! Warp atomic structure: Super useful if you have an engineering officer with disintegrate hull i found myself not needing it so much after finding the beam attack with panic to crew aswell but it does do a little bit more damage than standard attacks something you might want to think about in a sticky situation. Ablative Field: The thing about this ability that makes it not just a cut rate protective field is extra resistance 35% compaired to. Siphon Dark matter: Good for minor healing and crew panic overall it's just useful in certain situations. Bend spacetime: most useful in keeping one ship alive for quite a while even with low health. In my opinion deeply tied with science lucas scienceman. Drone swarm: Incredible attack that hits everything and causes high damage in the form of a status effect. Repair drone overdrive: in my opinion marginally useful if you want extra ship powers or lots of healing but, the ship comes with a stock drone heal that seems more useful but in dire when in dire need it can save ships from critical state and keep healing them. 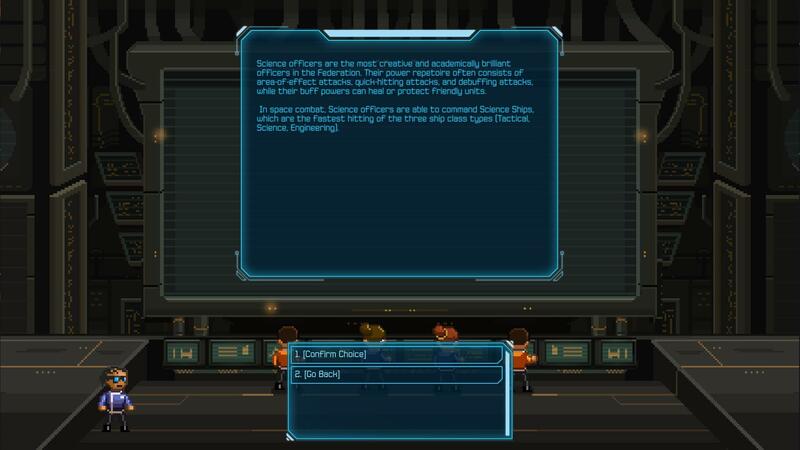 You will have to pick between Corbain Lau (Strategist), Lucas Beaumont (Physicist) and Isolde Freehold (Mechanic). The selection dialogue won't tell you their Epic powers. But never fear, this guide will tell you! Corbain Lau can unlock Doom Cannon. Lucas Beaumont can unlock Matter Reconstruction. Isolde Freehold can unlock Drone Swarm. See below for a description of each Epic power in detail. If this is your first time playing, you will probably want Isolde Freehold, but choosing a different officer won't kill you. You can still pick Corbain Lau, Lucas Beaumont, or Isolde Freehold, but you can now choose to hit the button at the bottom that says "Select from expanded officer list." This will let you build a customized officer. If you decide you want one of the presets, you can always go back to them. This step is purely aesthetic. Characters with the gold ring have bios. The other characters do not. Please see the sections below for a description of each class. 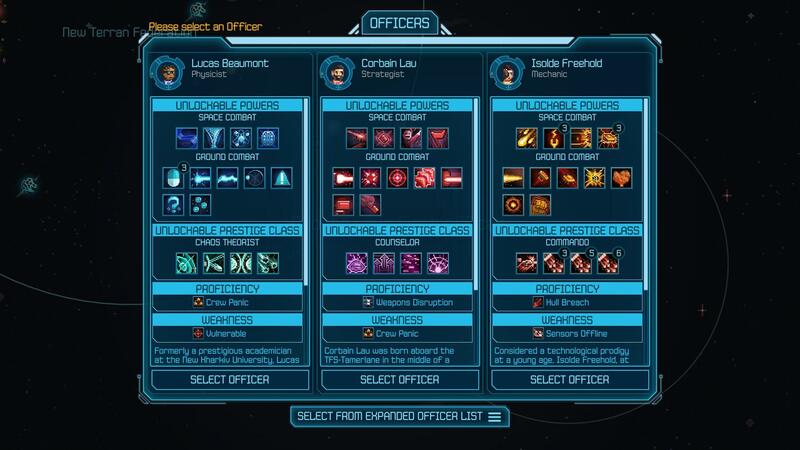 You will get to pick a second officer soon, so you don't need to worry about choosing between two options that look equally good. Depending on which class you picked, you will have 5 options. See the section below for details. If you don't plan to use the epic power anyway, this step is fairly irrelevant. Look over this page to make sure you have everything correct, then hit the confirm button. All Epic powers can only be used once per mission. They can be unlocked once the officer reaches Level 7. Fade To Black Gives all allies +50 Evasion and +75% Damage until each ship attacks an enemy. Works well with Strategists who take the Counselor path and use Meditation Boost. 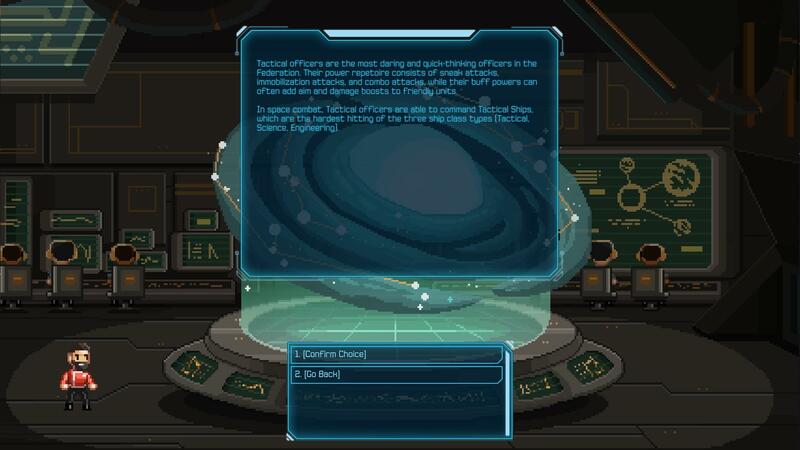 Doom Cannon Deals 500% Damage to one enemy, but inflicts Ship Disable (100%) and Engines Down (100%) on the user. If you have a good resistance to those effects, it isn't much of a problem, so it is best used by Operatives. Otherwise, it is best used as a finisher. Nuclear Strike Deals 350% Damage to all enemies. Inflicts Vulnerable (100%) on enemies and Vulnerable (50%) on allies. Combos well with Triple Shot. Bait And Switch Inflicts Entranced (100%) on one enemy. Also enables The Bomb. Entranced stuns the ship for 5 rounds, like Ship Disable, only longer and without the added resistance. The Bomb does 50% Damage against normal targets and 250% Damage agains Entranced Targets. This power has the unique ability to stun any boss. Bremachandra's Maneuver Deals 300% Damage to all enemies. Exploits Engines Down, making it a great combo for Strafing Run. Reduces the user's damage by 50% for the remainder of the battle. Good for finishing off boss escorts or when the user will be mostly tanking afterward. Dimensional Warhead Boosts threat by 800 when used. Inflicts an effect that boosts threat by 250 more and decreases damage resistance by 30%. Enables the Launch Dimensional Warhead power and the Power Dimensional Warhead power. Power Dimensional Warhead can be used to boost the damage of the launch from 250% to 500%, 750%, or 1000%, depending on how many times it is used. Launch Dimensional Warhead does the appropriate amount of damage to one enemy and exploits Crew Panic. It removes the Yabling's Parasitic Lash effect, the Voraash's Drain effect, Ship Disabled, and the Entranced effect (from Bait And Switch) from the target. It also removes the initial effect from the user. This power is good for drawing fire when tanking, so it is best used by Inventors. Drone Swarm Does 150% Damage to all enemies and inflicts Drone Swarm for an additional 126% damage for each of 4 rounds. Removes buffs and the Entranced effect from the target. Emp Overcharge Deals 50% Damage to all enemies, inflicts Ship Disable (95%) on all enemies, and inflicts Ship Disable (25%) on the user. Good for stopping attacks by fleets that do not resist Ship Disable. Brace For Impact Prevents you from taking damage until you use the now-enabled ram attack. Also prevents you from using attack powers during that time. You will have to wait an extra turn before doing anything after bracing. 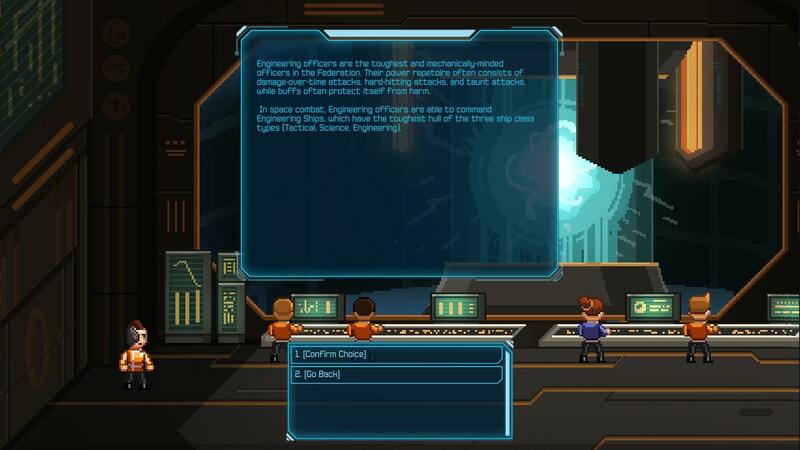 The ram attack deals 400% Damage to one enemy and exploits Ship Disable. It also removes all the same effects that the Dimensional Warhead does. You can cancel the effect and forego the ram attack if you wish. Causality Violation Removes all debuffs and adds +75% resistance to all standard status effects. Does not cost a turn to cast. This is good for removing DoT debuffs before they deal much damage. Kistler's Ague Doubles the duration of the six standard debuffs on the enemy fleet. The debuffs cannot be exploited for the three rounds before they revert to the normal effects. Matter Reconstruction Heals the fleet for 1000% Damage and removes all debuffs. This can put your fleet back at full strength. McKean's Hook, Line, and Sinker Forces the target to deal 200% Damage to itself on its next turn. Good for damaging large Tactical vessels. Singularity Does 300% Damage to all enemies. Inflicts Singularity (100%) and the six standard effects (75% each). Singularity does 117% damage for each of the next 3 rounds. Written by No one of consequence.